Hello all, I caught this little beauty near Edinburgh Castle in Edinburgh Scotland. 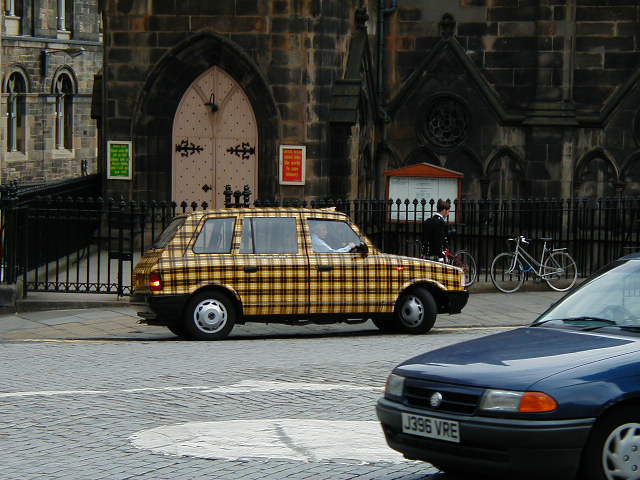 I am pretty sure he was a taxi cab but I would love to just think some normal guy was driving around in a car like this. I mean, wouldn’t you? Seeing little things like this are what travel is about for me. I thought I would share my odd ball photo as part of Cee’s Odd Ball Photo Challenge. For more strange and interesting photos check out her Odd Ball Photo Page! Cee’s Odd Ball. And for more car related photos check out my post on LeMans Car Museum and LeMay Car Museums. Now this is a great odd ball photo. Wonderful entry for this week. Thanks. Thank you. I am very inspired by your lovely “odd ball ” category. I hope to post many submissions in the future. I am excited about my first maiden odd ball post! Thanks for the fun idea. Welcome to the challenge! Your vehicle definitely qualifies as an oddball. Who cares if it’s commercial or not, because it’s full of fun, just the sort of thing I enjoy spotting while traveling. Thanks. I am glad you enjoyed it too! This little car always brings a smile to my face! You might enjoy these two vehicles I spotted in Beaune, France last year. Hahahaha…this is perfect for the challenge 😀 that’s a very striking color for a taxi! Brilliant idea. I’m glad you like it. Have you ever seen any weird cars in your travels? I’m glad you love it! I love it too! I wish I had one! I hope your week is going to be wonderful! Thank you so much. I’m glad you love it. I hope to post many odd ball photos for the future!